The nightmares were starting to take a toll. Father John lay in bed, staring up at the nothingness of the dark ceiling, aware of how heavily he was breathing but unable to calm himself. Rebekah stirred beside him, and he didn’t want to wake her. Lord Jesus Christ, Son of God, he prayed, trying to force his breathing to slow down, have mercy on me a sinner. That figure again, always that figure. That slight, small, hunched-over man with a demon’s face, sometimes oblivious to John, sometimes gesturing to him, sometimes calling out to him, always meeting the same, sad end at John’s hands. He pushed himself off the bed, grabbing the flashlight from the nightstand without conscious thought, being careful to stay quiet so he wouldn’t disturb Rebekah even though he was still feeling agitated and a part of him, a part carried over from the nightmare, didn’t care who he bothered. Seventeen sleepless nights now; seventeen murders on his conscience, even if they were committed only in a dream. Outside the night was still and peaceful, and a full moon glowed from the sky. Usually he sat on their front stairs, or stretched out in his winter jacket on the snowy front lawn and watched the stars—in collapsing, civilization had taken much with it but one benefit was that there were no longer any artificial lights to wash out the celestial view. But the full moon reminded him of the night, almost a year before, when people had invaded their home, people driven into a frenzy by the demons possessing them, and John decided to walk to the church, as he had on that awful night. A lot had changed since then; his community had insisted on repairing his and Rebekah’s house after they’d finished repairing the church, but in as short a time as three-quarters of a year, they’d restored many other homes, too, enough to provide housing for everyone. He walked past the houses, quiet and dark, and knew each person or couple or family that was sleeping inside, and whispered a prayer for each name as he passed by their home. Have mercy, Almighty God, he prayed, on your servant Louis, and on his daughter, your handmaiden Zoe. John paused, distracted by a mental image of Zoe, half of whose face had been burned by a possessed person before her father could fight him off. At sixteen, Zoe was already blossoming into a beautiful young woman, with long brown hair framing her round, cheerful face, but her left eye had been mangled and that side of her face was scarred with bubbled flesh, pink and stark white, the corner of her lip up-turned in what looked like an ugly lopsided smirk when one faced her. A beautiful young woman, John thought, who’d have to live with that scarred face for the rest of her life. He continued walking, and continued praying. Have mercy on your servant Isaac, he prayed. Have mercy on your servants Maureen and Brian, and on their daughter, your handmaiden Lucy. Have mercy, Almighty God, on your servants Steven and Theresa. Have mercy on your handmaiden Stacey and on her daughter, your handmaiden Debbie. Have mercy on your servant Tom, John continued, as he looked up at the tall apartment building on the corner of Main and Down, where Tom chose to live alone in a penthouse suite because he said he liked the exercise of running up and down twenty-eight flights of stairs every time he went home. Have mercy on your servant James. John turned on Down Street. The air was chilly, but he didn’t mind, and he was glad to not have to use the flashlight and could conserve the batteries a little longer. He continued to pray, for Liz and for Robert and Patricia and their son Kyle and daughter Sylvia, then for Lance and Tina and their sons Walter and Aaron. Finally, as he approached the doors of St. George, he asked God to have mercy on the subdeacon, who had insisted on living in the church even when everyone else had moved out into the neighborhood. Hand poised on the door handle, he wondered if Michael were still awake, and hoped that he wasn’t so John could be alone. He pulled open the door tentatively, then stepped inside and waited for his eyes to adjust. As much as praying and walking through the wintry nighttime chill had started the process of making him feel better, being in the church—this parish of his youth, and the safe haven when the world had gone mad—completed his healing, to such an extent that when he found Michael sitting in the pew in front of the altar, his initial reaction was one of pastoral and almost parental concern. “You couldn’t sleep either?” he said, speaking softly. Startled, Michael looked up at him, then sat up straighter in the pew. “I only sleep a few hours a night, Father,” he said. He shifted over so John could sit beside him. Moonlight streamed in through the glass windows, many of them salvaged from other buildings and rather inexpertly mounted into the frames. After a long and awkward pause, John said, “I had a strange dream.” He refrained from telling Michael that he’d had similar strange dreams many times before that night. “Probably you’re right,” John said, the lie suddenly revealing the reason he was so reluctant to speak to Michael about his dream: his own sense of pride and propriety, his own fear of being discovered as an imposter not worthy of his position. But if anyone knew how little John deserved the honor of priesthood, Michael certainly did. The subdeacon opened his mouth but didn’t respond. Michael spoke more easily now, and John was glad he’d brought up the topic—it seemed to him that Michael had been wanting to talk to him, but was too kind or deferential to confront John directly. “What’s happening to you?” Michael said, the features of his face tightening. “He’s a man,” John said. “The ugliest man I’ve ever seen. He has this face like a hyena, thin and narrow and with grotesquely large ears and these ink-dark eyes and a flat wide nose and a mouth that stretches from one side of his small face to the other. I hate him. I’ve prayed that I’d be able to see Christ in him, but he is so ugly that it drives everything else out of my mind. As soon as I see him, I want to kill him. Sometimes I leap on him and choke him to death, sometimes I beat his head against the ground, sometimes I rush him and push him off a cliff. Sometimes I drown him, holding his head under water until he stops fighting. I know, John thought but didn’t say. But that means I’m either crazy or going crazy from guilt over past sins, or I’m under assault by some demon or demons my own prayers don’t have the strength to ward off. John put his hand on Michael’s shoulder and squeezed, then stood up. Outside, the moon had disappeared behind a screen of clouds, but there was enough light still and he took his time walking home, hands shoved deep into his jacket pockets. The demons, like zombies, kept coming back from the dead, he thought. Once he’d felt very victorious, carrying Christ’s banner into the world, casting them out of possessed people; soon enough he realized that the demons were escaping into animals—cows and chickens and pigs, deer and turkeys and rabbits, not to mention cats and dogs—and then making those animals kill themselves. Without livestock and without game to hunt, they had to eat through too much of whatever food they had and could find, and supplement their stores only with fish, an animal at least that the frenzied, escaping demons seemed to leave alone. He’d considered the slaughter of the animals a parting shot from the demons, but now they seemed to have returned to make sure John couldn’t find peace and rest even in sleep, if nowhere else. He pushed aside the thoughts and prayed the rest of the way home. As soon as he put his head on the pillow, something like a thick blanket of tiredness fell on him. He had time and enough awareness to thank God for the tiredness, to thank God that he would get more sleep that night, thank God that maybe the strange sequence of dreams, whatever its purpose if it had one at all, had finally run its course. But he dreamed again of the figure, and it was the worst dream yet. Perhaps because John had told Michael that the figure had a hyena’s face, in this dream the man was actually a hyena, and John wasn’t himself but a lion. In the dream, John lay peacefully on a patch of grass, head resting on his paws, but he detected movement ahead and looked up. The hyena prowled, hunched-back, its narrow, elongated face and round, black eyes fixed on John, its small but sharp teeth bared, giving an overall sense of a compressed spring, ready to leap on John. But the ugly creature didn’t get a chance—as soon as John saw it, he roared. Fire came out of his mouth and enveloped the hyena, and it screamed horrifically, and rolled around on the ground as it burned to death, trying to put itself out, screaming in pain for a long time and then whimpering for a while and then silent. When he woke up, John felt like the lion was trapped inside of him, pounding against the walls of his heart to be unleashed, and that once he was set free, the lion would burst out of him and tear down his house and even the whole world in his incredible rage. The nightmares continued, and kept taking their toll. The following Sunday John forgot words to the Liturgy, and had to be rescued by the subdeacon, who tried to be discrete, but everyone saw what had happened. John had been too tired to prepare a homily, and it showed: he started one train of thought about the Prodigal Son, only to interrupt himself with another thought about his elder brother, and then became distracted by a third point he wanted to make about their father. The people of his community sat in the pews, listening politely, but he could see the concern and confusion in their expressions, which distracted him from what he was saying even more and made his talk even stranger. One of the most beautiful and profound stories in the Bible, he thought, and I’m making a mess of it. While offering Holy Communion, he forgot Maureen’s name so that she had to whisper it to him; he pretended he had had to pause to swallow, but it was too late and the look of hurt on her face, which Maureen tried to cover up as inexpertly as he’d tried to cover up his sudden memory loss, was unmistakable. The community was entirely out of coffee beans, and running low enough on gas for their generators that they were very careful with how they used electricity, so “coffee hour” in the church basement had turned into “water hour” many weeks before. John came downstairs, looking for Rebekah to try to hide behind her until everyone left to get on with their day, but Isaac found him first. “That was…interesting,” the big man said, a smile of friendly teasing on his round face. John tried to push back his annoyance. “I’ve been meaning to speak with you,” he said. “I think we need to start searching further. We need supplies. And there may be people still out there who need our help,” he added, realizing too late that that was the wrong order. Isaac’s smile dropped off; John had never interfered before, leaving Isaac to organize the search and scavenging parties in whatever way he thought best, recognizing that even in the coldest months of the winter Isaac and his volunteers had walked or biked throughout the days and slept in tents or abandoned homes at night to search for food and water and medicine and gas and other supplies, anything they could find that hadn’t spoiled or been claimed by another group of survivors. Sometimes those survivors came back with one of Isaac’s search parties, but even when the others chose to remain where they were, the news that another group of living human beings had been discovered filled John with joy. But lately Isaac and his groups were coming back empty-handed and with little or no news. He heard his name spoken in a forceful manner and realized that his wife had finally found him. Rebekah mumbled something to Isaac—who stared at John with a mixture of betrayal and shame in his wide eyes—and pulled John back into the dark staircase, up the stairs, into the narthex and outside the church’s front doors. She ignored the casual dismissal of her project—a project that he’d told her truthfully was brilliant and wonderful when she’d proposed it a few months before, in the dead of winter. “—and what if there isn’t enough rain?” he snapped. Rebekah stared at him silently for a while. He looked away, past the street to the clearing surrounded by trees and the river behind it, the clearing where almost a year ago his beautiful, gentle wife had tried to kill him because she was possessed by a demon. He had so much now, recovered so much of what he’d thought lost, and yet he felt himself full of annoyance when he should be full of thanksgiving, in a constant state of agitation when he should be in a state of gratitude. John shook his aching head. The words sliced into his heart, but he held his tongue. “You’re sending me away,” he said finally, unable to avoid sounding like a reprimanded child who was almost literally being sent to a corner to think about what he’d done—or, rather, to the principal’s office, except that Father Christopher was so gentle and meek that the last thing John associated with him was a disciplinarian. Whether it was her little joke or the beaming smile she gave him, something found a crack in John’s crusty outer layer and he allowed a smile of his own to escape. He left the next morning. Tom lent him his own bike, a sturdy mountain bike that would roll along fine on the icy and snow-covered roads, and that could also be taken on the frozen grass and dirt when abandoned cars and other obstructions forced John off the main roads. He made himself listen patiently to Tom’s directions, even though John remembered exactly how to get to Father Christopher’s church. In a community as small as theirs, news traveled faster than anything else, and it seemed everyone had gathered in front of John and Rebekah’s house to wave him goodbye, including Liz and the children. “Aren’t they supposed to be in school?” he said to her, kindly. “No way am I doing any of your homework!” Father John said suddenly, leaping on the bike and taking off, so that from behind him he heard the giggles and squeals of the children as they seemed to quickly decide that running after him was a better use of their energy than yelling at him for not playing fair. He looked over his shoulder as he turned on Main, slowing down a little to give them some hope, and noticed that Liz and Isaac and some of the other adults were running with the kids too. As he turned right on River, he stopped and looked behind and waved to the group, then continued on, pushing himself even faster than before, loving the feeling of the cold wind against his face and appreciating the warm wind-breaking clothes Isaac had provided. Within ten or fifteen minutes, though, he heeded the increasingly loud protests of his thigh muscles and slowed down, then rode on at a more reasonable pace. It would take another two hours of consisting riding at least to get to Sts. Peter and Paul’s. He took a break about halfway there, getting off the bike and walking it for a while to give his backside a break from the seat. He’d forgotten how painful the first ride of the season could be. From the small saddle bags loaded down with supplies for Father Christopher, he pulled out a small plastic bottle and unscrewed the top. As he brought up the bottle to gulp back the water, he saw something in the sky, something dark, small but much larger than a bird. The vision was there for only a moment and then was gone, and in that instant of observation, he’d thought it was a small and dark plane, though it was soundless. In the next moment, with nothing at all in the sky except for the occasional cloud, he told himself it was only his imagination, drank almost all the water in the bottle, and got back onto the bike. He didn’t quite believe himself, however. Even though he was exhausted, even though his mind was sleep-deprived and could be playing tricks on him, even though he and everyone else had assumed that all civilization everywhere had collapsed (and had extrapolated the extremely rationed use everywhere of whatever gas remained, based on their community’s practice and that of every other community of survivors they’d encountered thus far), he knew he’d seen something. Something had been in the sky, but had zipped by too silently and too quickly for him to catch more than a peripheral glimpse of it. Something had been in the sky—something that wasn’t a bird and wasn’t a cloud—and as he cycled on, John’s mind turned with the implications of that thought. 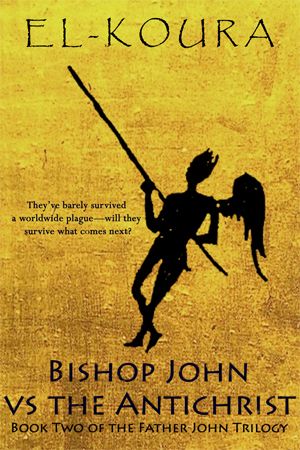 Find out what happens next—Bishop John VS the Antichrist is now available for purchase.